It's crazy to think that having been to Japan 9 times, and this is my 3rd time in the Kansai region (Major cities: Kyoto/Osaka/Nara/Kobe), this is my first time seeing Japanese Maples. 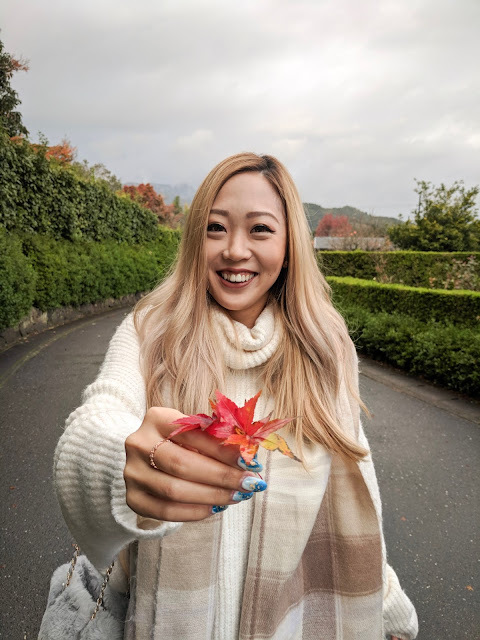 I've always visited Japan in summer time, and I was giddy like a kid being able to see Japan in autumn time. There's usually a calendar for Cherry Blossom and Maple season as it attracts a lot of tourists within Japan as well as overseas to travel up and down the country to chase these leaves changing colors. 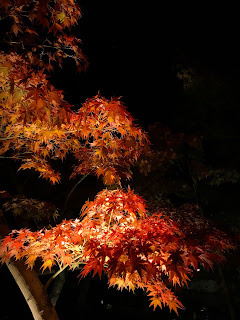 This year, I caught the beginning of maple trees changing color on the second week of November in Kyoto. What is Night Viewing and when is it? During both Cherry Blossom and Maple season, temples in Japan with distinguished gardens will have special night viewing sessions. 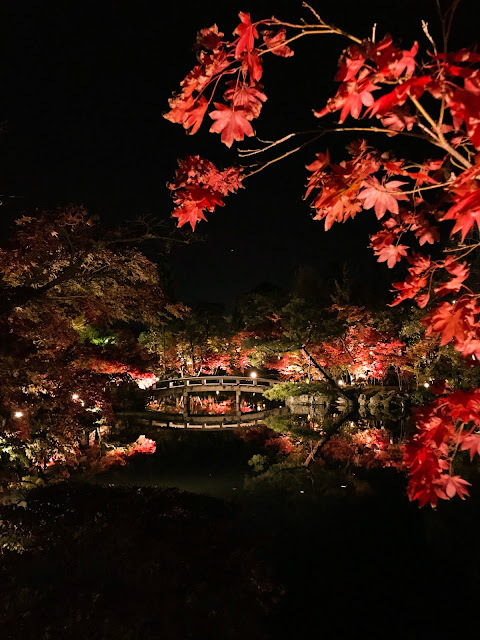 This year most of the temples had daily night viewing sessions starting the second week of November. You can still enter the temple during the day time, but some will have a break in between and reopen at night. Nightfall is at 5:30pm, so night viewing generally starts at 5:30pm and stays opened up to 9:30 or 10pm. 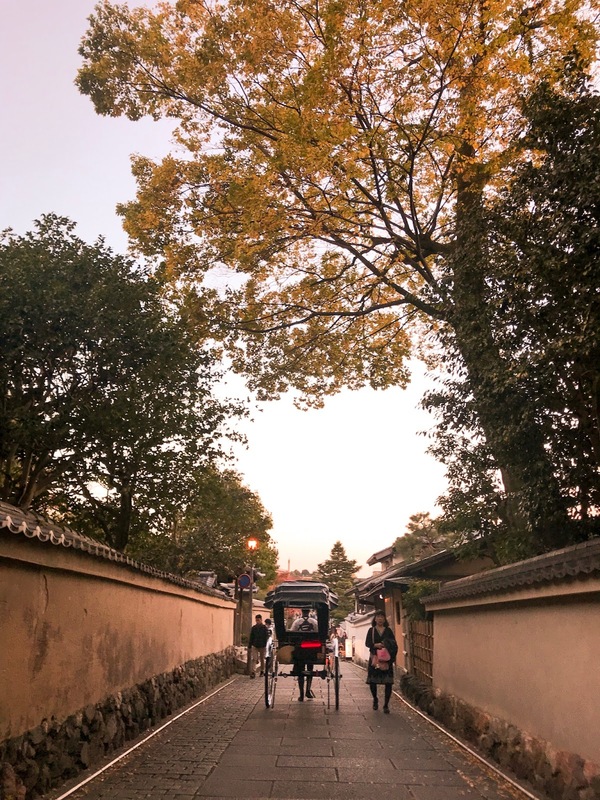 For the most updated schedule, there are pamphlets at the tourist office or restaurants throughout Kyoto, so you can just pick one up once you are there. If you are planning to see Kyoto in the day time then there's a bus that circles the city which will take you to most major temples. There are also black cabs available on large streets for hire. If you are planning to go to the night viewing sessions, I would highly recommend renting a car. In my case, my partner and I rented a car at Kansai International Airport and drove straight into Kyoto from there. Parking is pretty easy to find in Kyoto, and if you go at the start of the season the traffic isn't as bad. 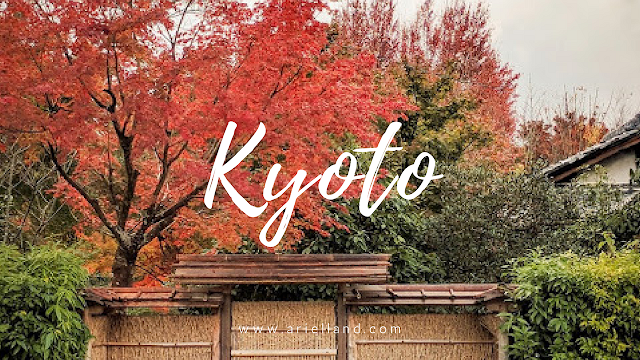 You will be able to get to so many more places if you were driving around Kyoto. The Temples are spread out across the city around the outer rim, so it's hard to rely on buses later at night. You can prebook a car online here https://rent.toyota.co.jp/eng/ and pick it up at the airport. 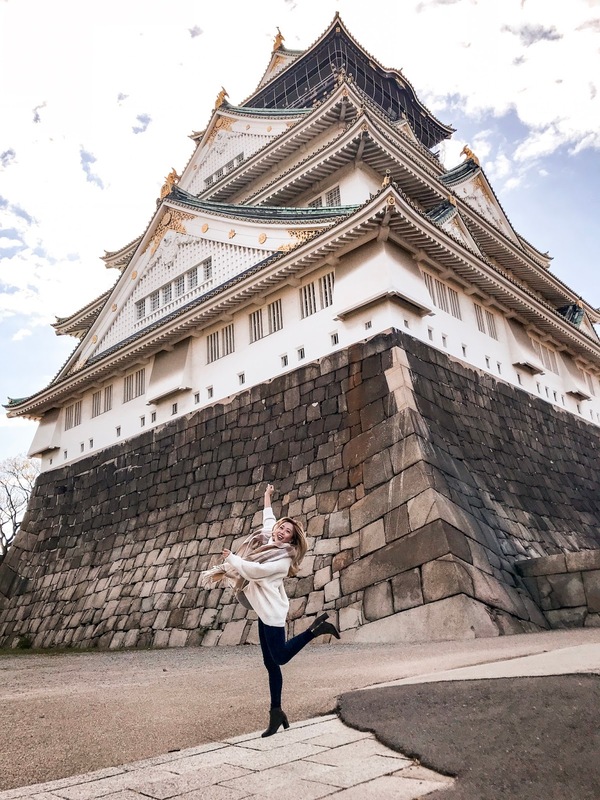 We hired a pretty standard 5 seater sedan, which was ￥8,000 a day that took us to and from the airport to Kyoto as well as back into the city of Osaka. There are some tolls you have to pay on the highway, and then other than that it's parking which costs around ￥300~400/hour. If you don't read Japanese, using the GPS system may be difficult. But there's an easy trick, just use the phone number of the location and the GPS will take you there. Most temples will have a number designated to the temple office, and for places like Arashiyama Bamboo forest, I found the closest business around there (which was a museum) and used that phone number instead. 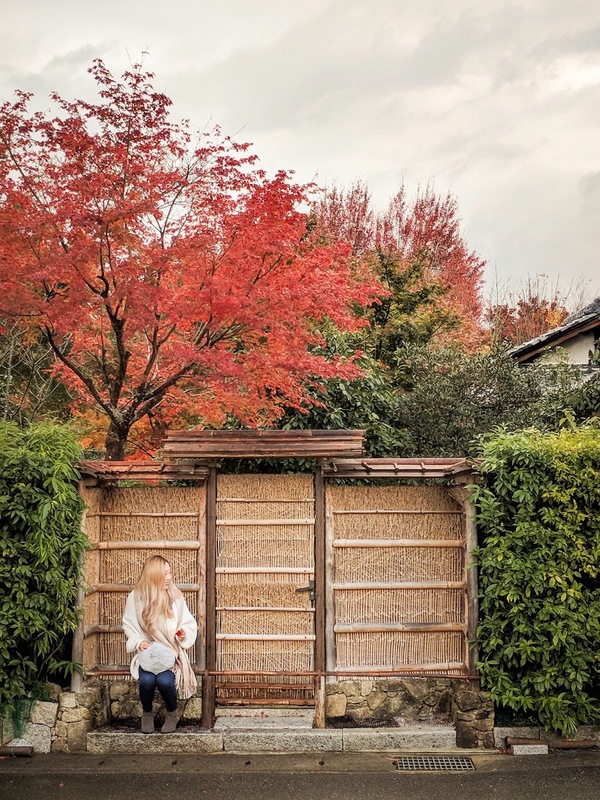 You can find this everywhere on the streets of Kyoto, especially near large sights like Kiyomizu Temple, Arashiyama Bamboo Forest area, and Yasaka Shrine. You can do walk-ins, but in busy seasons, prebooking online would be ideal. It takes about 1 hour for picking, dressing, and some more time for hair as well. 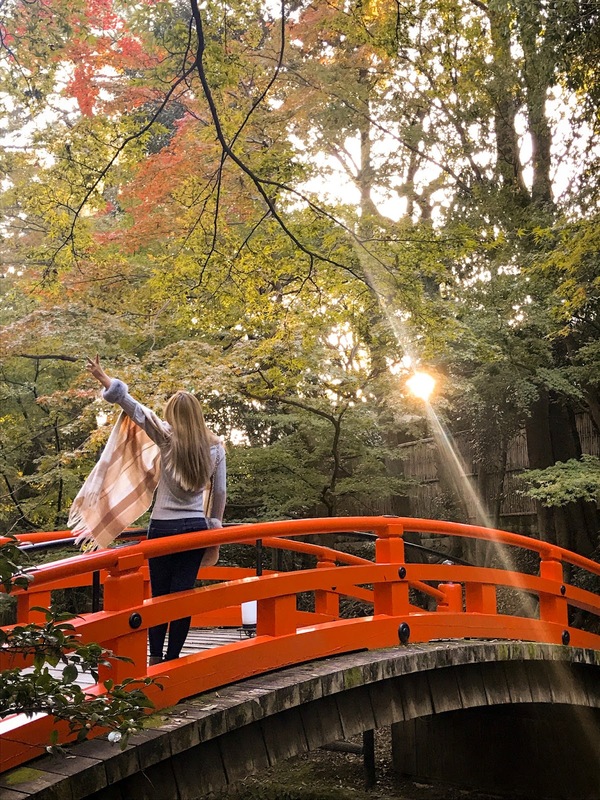 You can go for budget Kimono rentals from ￥3,500 yen to silk Furisodo (long sleeves) kimonos costing around ￥9,000 yen. If you'd like for an early dressing, you can arrange separately with the shop owner to open the store early, but of course it costs extra, and by the hour. For example if they open at 10am, and you request for an 8am opening, they will charge you 2 hours of early open fee. 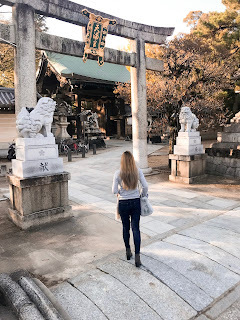 I wanted to beat the crowds, and I was trying to get to Fushimi Inari Shrine in a Kimono. 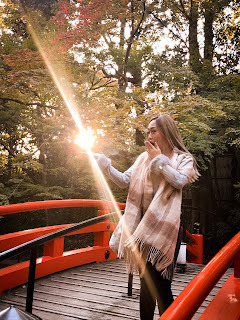 As the #1 spot to visit on Kyoto, that meant I needed to have my dressing done at 7am and be in Fushimi Inari as soon as the doors opened at 9am. 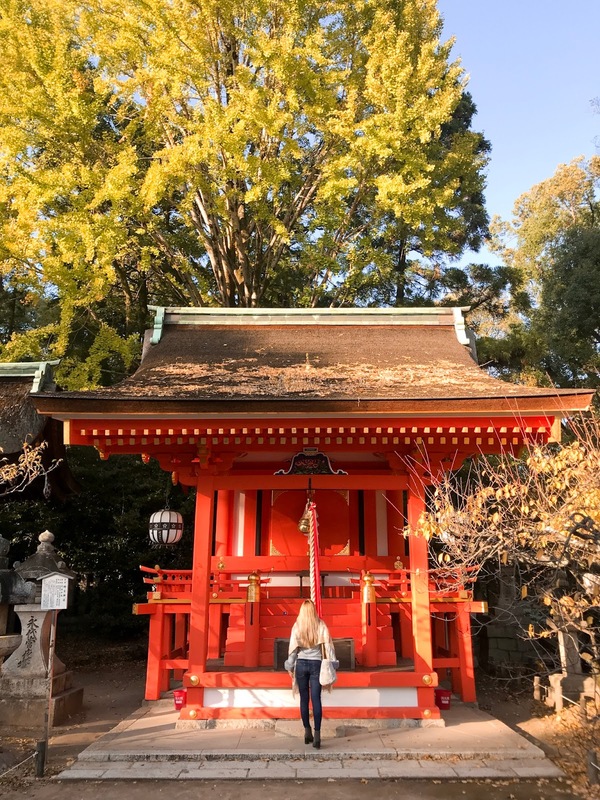 This is the head shrine of the god Inari (God of Rice, worshiped as the patron of business), and is iconic to Kyoto. 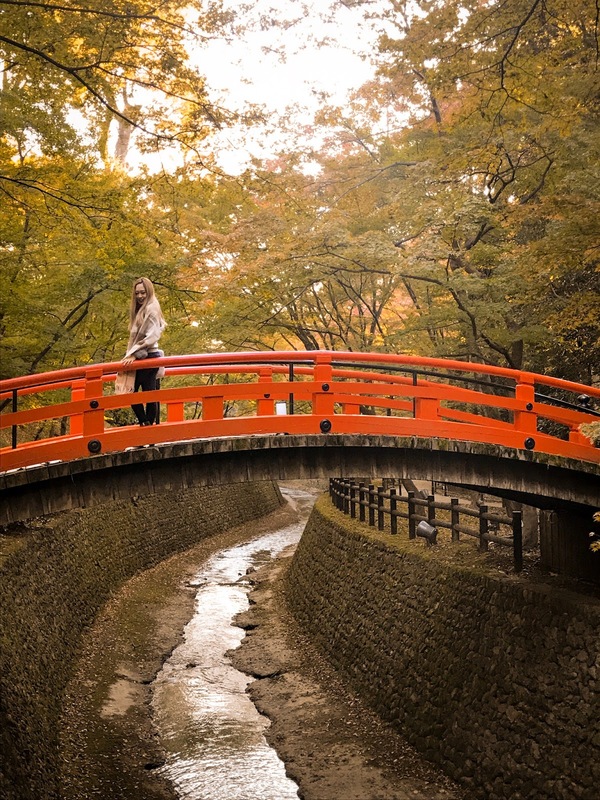 If you've seen Memoirs of a Geisha, little Chiyo runs through a long walkway with rows and rows of red wooden gates. 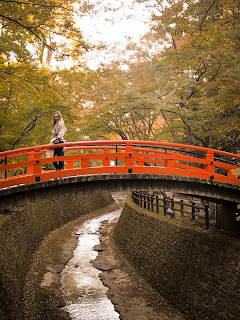 These red gates are called "Torii", and the movie was filmed at this very temple. Each of these Torii gates has been donated by a Japanese business, and there are over 10,000 Torii gates up this temple ground. 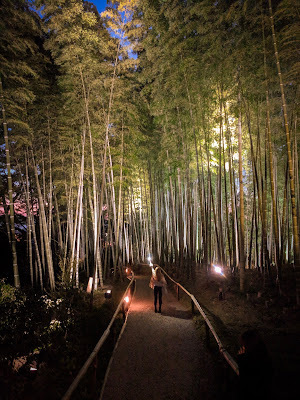 Take (Tah-Kei) means Bamboo, and You means to have fun or enjoy. 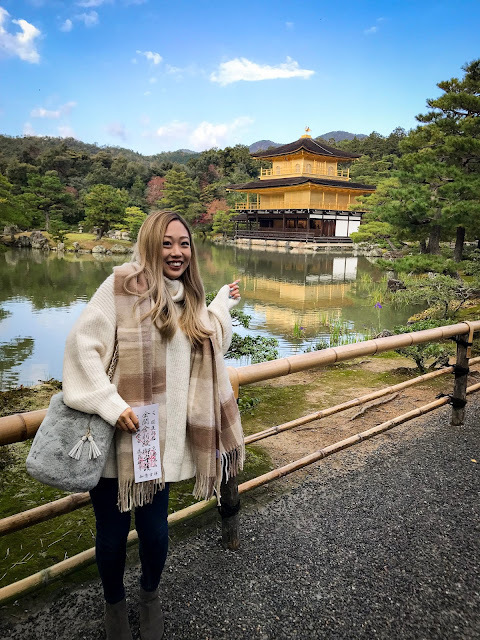 This is one of the iconic sceneries you see of Kyoto, along with The Golden Pavilion (Kinkakuji) and Fushimi Inari Shrine. 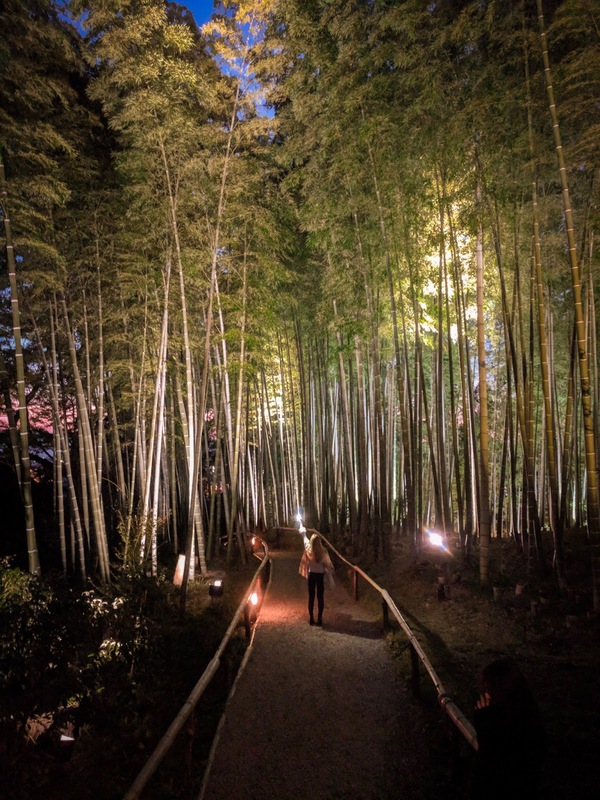 The thing with Arashiyama is that it is public space, so it is opened 24/7. So the only way to beat the crowd is to arrive at the break of dawn. I had a painful 5am awakening to drive across town and I practically ran into the forest as I saw some tourists already. For the most part though, people who arrived at 6:30am in the morning are serious photographers, and are mostly really respectful of one another. I wonder if they hate me, because I pretty much showed up with an iPhone (still, amazing photos though) Another tip, scout out the area the day before, or have very clear google maps directions to where you are going for a photo, it's easy to get lost in the bamboo forest. After I got the shot worth waking up at 6am for, I ended up in a quiet neighborhood nearby. I really had no idea where I was walking, but the maple trees were blooming and just absolutely beautiful. It's always amazing when you accidentally stumble on things just wandering around. 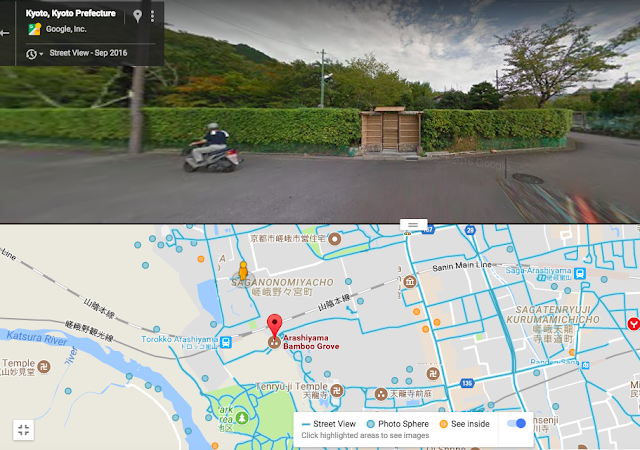 If you google "Arashiyama Bamboo Grove", this gate with the maple tree is just north of the Bamboo Groove. See the yellow person on google maps above for location. I was just one day too early, and wasn't able to get to the night viewing. 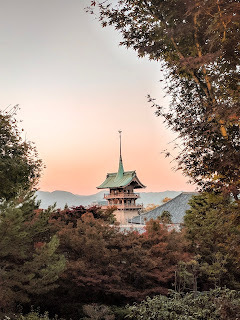 But I was at Kitano Tenmangu during golden hour at sunset and it was beautiful. The leaves were only just changing into yellow, and the sunlight was seeping through the leaves. 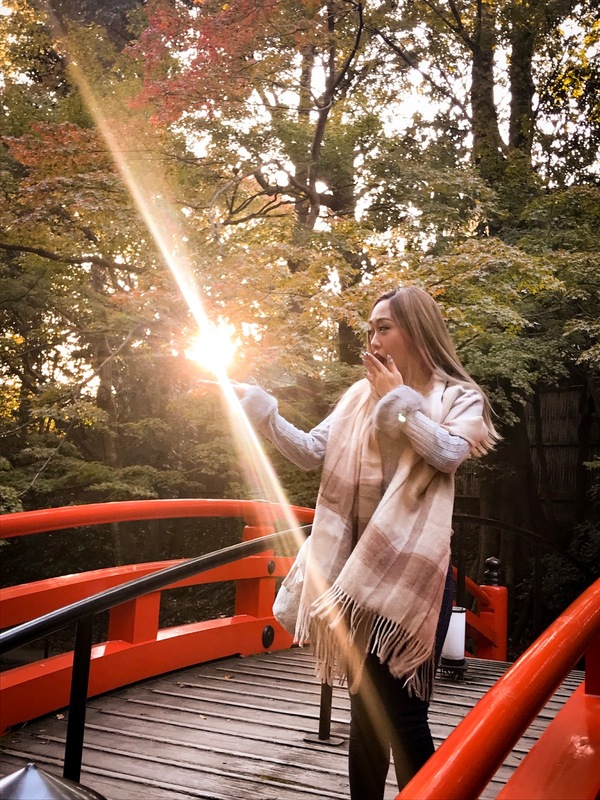 There's actually a word in Japanese to describe sunlight filtering through trees - 木漏れ日 Komorebi. 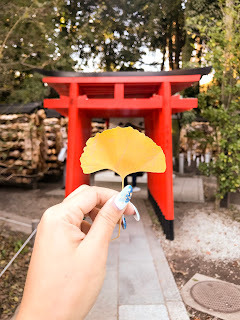 As seen in the photo below, Kitano Tenmangu has a really special "water Omikuji" (fortune telling paper). The words appear after you dip it into water. The Omikuji is available in English as well. If you keep walking further down, you'll eventually get to a small creek and a red bridge crossing it. Kodaiji is a temple of the Rinzai School of Zen Buddhism. 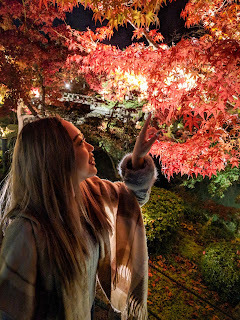 It was established by Nene, the widow of Toyotomi Hideyoshi to pray for her late husband. Toyotomi Hideyoshi (豊臣秀吉) is a prominent political leader of the Sengoku period and ruled Japan from 1585 - 1591. He is Japan's second great unifier that brought an end to the Warring States (Sengoku) period. In this temple, there's a small lake in the middle, in front of a traditional Japanese garden as well as a teahouse at the top of the hill. 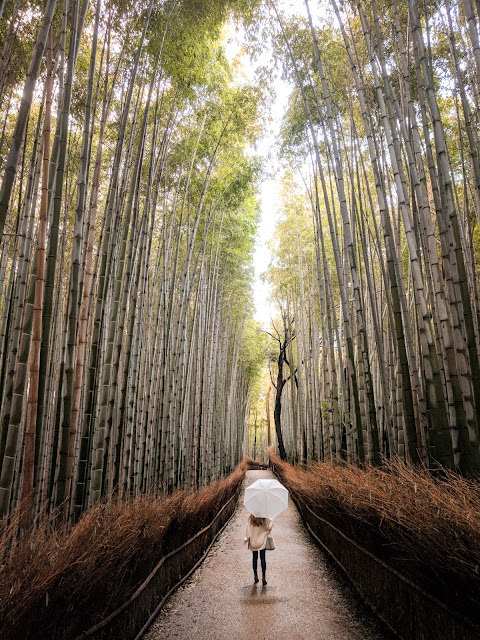 Towards the end is also a small bamboo groove, much quieter than the one in Arashiyama, so if you are keen for a photo but not up for a wakeup call at 5am, this is a great alternative. 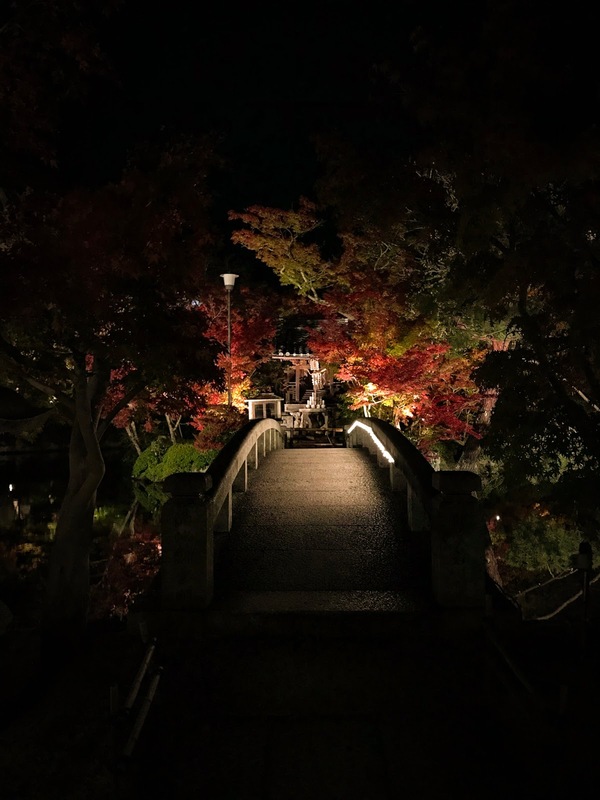 This is one of the most iconic Night Viewing spots for autumn leaves. It is the head temple for the Seizan branch of Japan's Jodo-Shu (Pure Land) Buddhist sect. Eikando - View of Eternity Hall, Zenrinjin - Temple of Forest of Zen. The temple was blooming with Autumn Maple every corner I turned. The leaves turned bright red, and with the night light formed a very romantic setting. The middle was a lake, with water so still it formed a perfect mirror reflection of the bridge in the middle. I've travelled so much, and it's rare that I find manmade gardens breathtaking. This garden is a work of art. 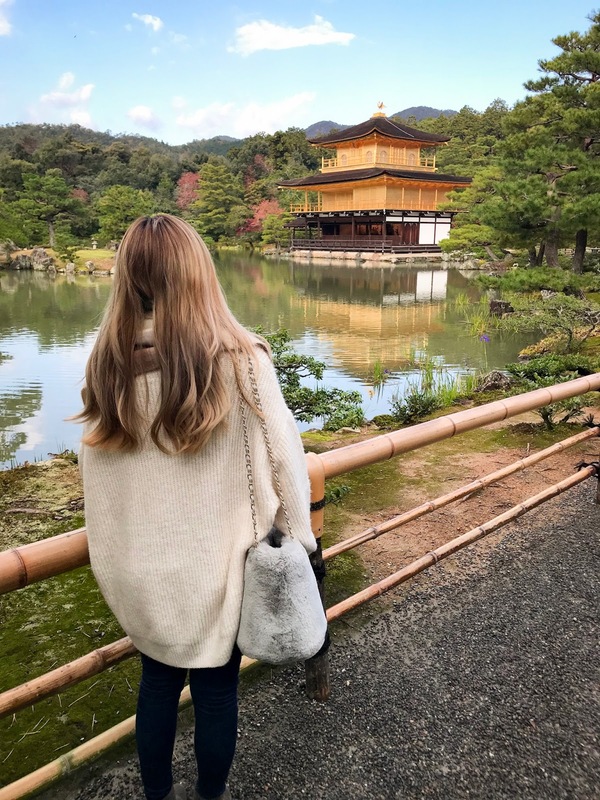 Commonly known as the Golden Pavilion, Kinkakuji is one of the top 5 most popular destinations in Japan and is also a UNESCO World Heritage site. There's also plenty of Maple viewing within the Golden Pavilion but is beautiful throughout four seasons. Upon entering you can see a big bell from the Kamakura period, you can ring the bell for good luck. I took around 40 minutes walking around. When I got out, it wasn't even 10am yet, but the crowds were pouring in and there was barely any space to walk. It's good to get to Kinkakuji right at 9am in the morning if you'd like a clear shot of the temple and also some peace and quiet during viewing. 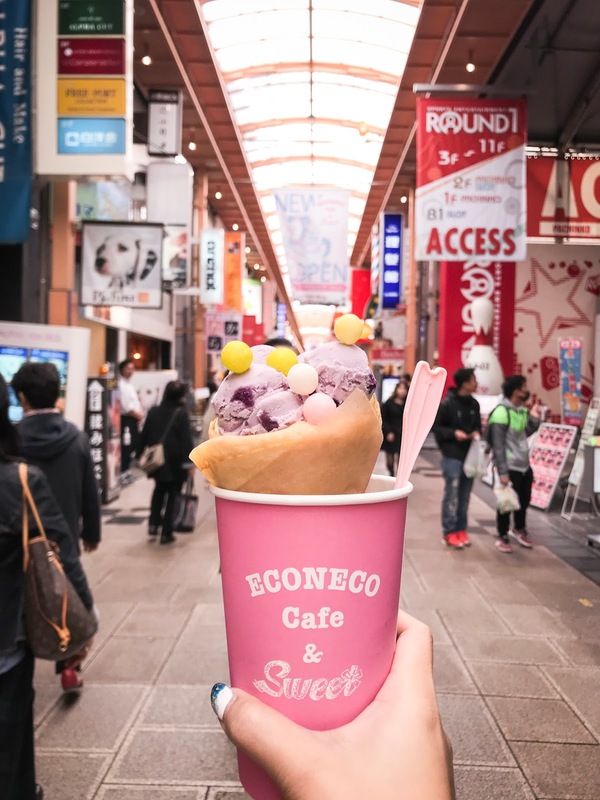 A quick update of Osaka, I ran into this cute ice-cream and crepe shop on accident in Shinsaibashi shopping arcade. It's called "Econeco", 絵子猫, which means Picture Kitten. (Eh-koh-NehKoh). 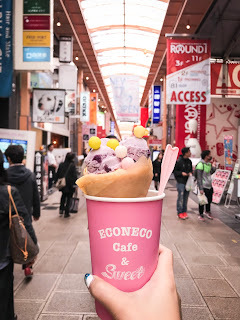 I'm normally not much of a sweets person, and I rarely post photos of food on Instagram, but this ice-cream was not only so much fun to look at and take photos with, it actually tasted good. I really don't like it when deserts are made of pure sugar. This one was just sweet enough but didn't kill the taste of everything else. Another important item on the agenda for Osaka is to see Ayumi Hamasaki's concert! 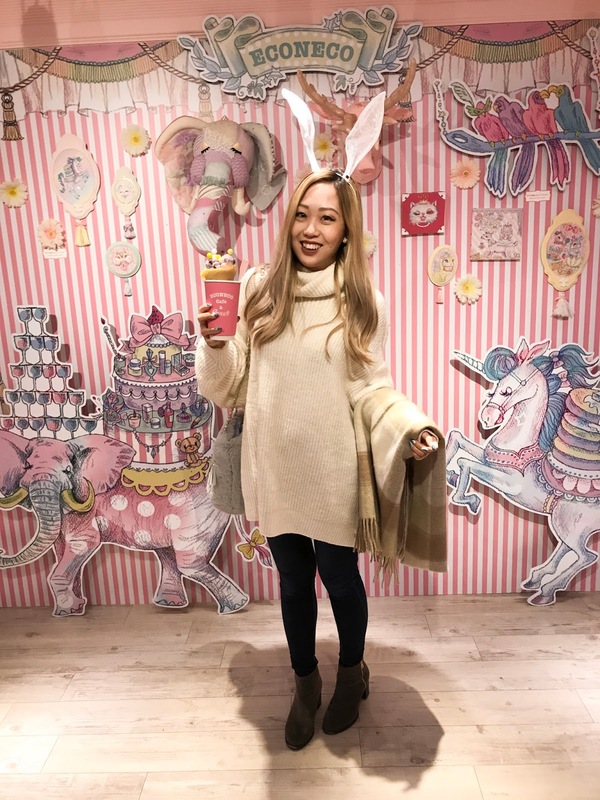 I started learning Japanese through her songs as a teenager and have been a huge fan of her. I've seen her once in Hong Kong, but haven't heard her perform. A lot of people who don't know her criticize her heavily, but little do they know that she's actually fully deaf in one ear and half deaf in another. She's broke the record to most live concerts within a year. The thing about being a performer is, you don't just bank on how high your pitch goes, how long you can hold your notes. A performer is someone who inspires fans, someone who leads the trends, and can change people's perceptions about the world. And this is why, despite her not being so famous outside of Japan, and despite the criticisms from other artists, her fan base hasn't really decreased, her records are still coming out and concerts still selling out. She has her own new years eve countdown live concert in Tokyo's Yoyogi Arena. That's 13,000 people paying concert tickets just to countdown with one performer. I am so glad to have been able to watch her concert. She's 38 and her hearing is weakening. No one is sure how long her singing career will still last. But she remains hardworking and dedicated to her fans, crew of dancers, singers, and band. Last but not least, an early visit to Osaka Castle. It opens at 9am, but most people wander around in the front garden area, take their time with selfies etc. I didn't hesitate when I entered, and ran straight to the back side of the castle for this photo. Here you get the clearest shot with no trees, handicap elevator, vendors, and hoards of people in the way. But of course just minutes after 9am, people started showing up and capturing photos from this spot. It wasn't as brutal as the 5am wake in Arashiyama, but just like Kinkakuji, easily accessible and famous spots fill up quickly. 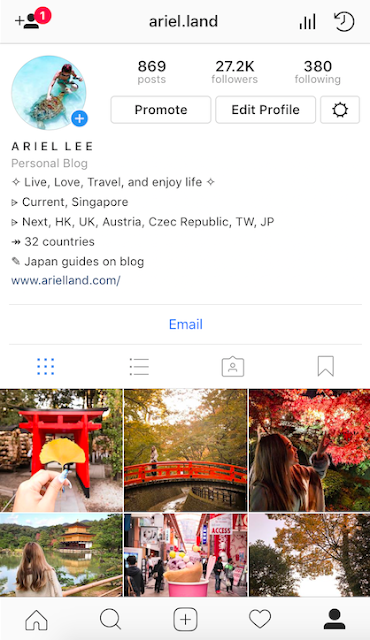 Scout out the day before and know where you are going if you'd like to capture Instagram worthy shots without frustrating the hell out of yourself. Next up, it's Christmas! I've spent the past 4 Christmases on beach holidays in Thailand, Capetown, Malaysia/Indonesia, and the South Pacific. This year I'm changing it up a bit, all the way up North to snowy Europe. I'll be stopping in London, Salzburg, Hallstatt, Prague, and back to London for the countdown. Beautiful! Going to Kyoto and Osaka early next month. Can't wait!